It turns out apple sauce is really easy to make. So easy I debated not writing a post about it. Then I thought it's simple and that's why ya'll should know about it. There are no apples around here. We had an unseasonably warm spring. We kept walking around without jackets on in March and April going, "It's so nice". The whole time we were holding our breath waiting for the snap back abruptly into winter. Then it did happen right as the fruit trees were blooming and just like that the flowers were frosted and there would be no apples, peaches or pears in northeast Indiana for 2012. We visited a local apple orchard when Jeff's brother and sister in-law came to visit at the end of September. We knew there would be no apples to pick, but we went anyways for their cider tasting. 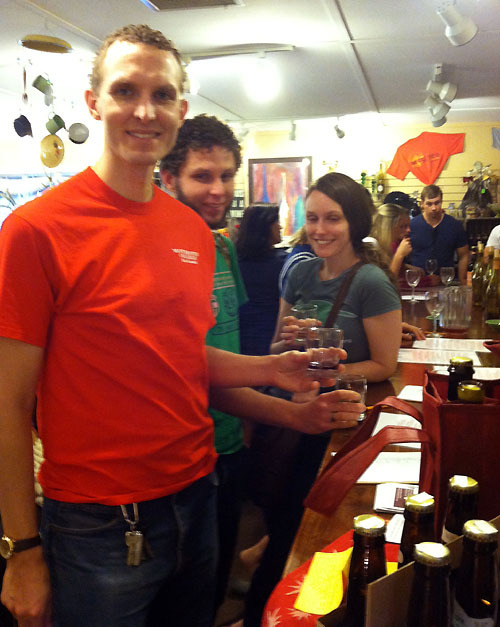 McClure's Orchard in Indiana offers 24 kinds of hard cider and wine as well as 3 sweet ciders. We couldn't pass that up! Tasting glasses ready at McClure's Orchard. Now I'm wondering if we could brew our own cider. I love the champagne-like, aply named Celebration cider and Jeff was a big fan of the Grandpa's Bourbon Barrel Aged. Both tasted nothing like the sweet stuff I think of as cider. Back to the apple sauce. They didn't have apples to pick at the orchard but they did have lots bought in from small orchards in neighboring states. I got a half bushel of 'Johnathan' apples to make into sauce. To make apple sauce all you do is peel and core the apples, throw them in a pot with a bit of water. Boil until soft and then puree. It's just apples, no sugar, no salt, no lemon juice. Compared to the seasoned tomato sauce, salsas and pizza sauces I've been making this recipe was a snap. It took all of three hours start to finish. We start 'em early in the kitchen. I'm not a huge fan of apple sauce, but I'm betting some canning jars on the fact my little one will be. She just past the four months old mark and this winter we'll start introducing food. That's why I canned the apple sauce into half pint jars. A half pint is one cup. That's probably a couple servings for a baby. I'm thinking once she's a little older, I'll be mixing in some cooked cut pieces of chicken, zucchini or liver. A half bushel of apples yielded 12 half pint jars. I've been considering getting another half bushel to make another batch because I'm not sure how much she'll want and it's not like apple sauce will go bad if it doesn't all get eaten in the next 12 months. Anyone have any thoughts or experiences to share in that department? A lot of the veggies I'm freezing this year are with baby food in mind. Think she'll like kale or chard? Me neither. I am hoping to sneak them in with other foods. Also on the docket to be frozen are roasted red pepper, rutabaga and beets. I just ordered Baby-Led Weaning: The Essential Guide to Introducing Solid Foods - and Helping Your Baby to Grow Up a Happy and Confident Eater. I'm curious. Anyone tried it? Gently boil apples in a half inch to inch of water in a large heavy bottomed pot on the stove. Stir occasionally to prevent sticking until fork tender. Fork tender is when you can stick a fork in and the chunk doesn't break. Puree in the pot with an immersion blender or if you must, batch through a food mill or blender. Can - Fill sanitized jars with the hot apple sauce leaving 1/2 inch of head space. Clean the rims and put on the lids. Immediately process in a boiling water-canner for 20 minutes for pints, half pints or quarts. Freeze - Let cool, fill freezer containers cover and pop in the freezer. Wow, I had no idea it was that easy! I'll have to keep this in mind for the future when I have a little one :) Your baby is adorable! We live in Northeast Indiana also and I was shocked when I went to our local orchard to get some apples for canning. They were selling what they had faster than they could box them up. And the pears didn't have that familiar pear shape to them at all (which made them a bit harder to peel). My daughter and I got 40 pints of applesauce canned for this winter. You are right...easy peasy to can. Your little one is a real cutie pie! You must live near by! You've got to be the first food blogger I've found in these parts! We live just 15 minutes north of Fort Wayne. I was surprised to see that you were from around here too. Have you ever seen the movie, Baby Boom? Your post reminded me of that movie. Your applesauce is a beautiful color. Well done. I had to google "Baby Boom Movie". You're right, now I just need to market my Apple Sauce and grow a business! Funny, I just did my post and mentioned that I have too many apples. Yes, making apple sauce is super easy. I add a lot of cinnamon to mine though. Thanks so much for sharing your fun adventure. I think I would like that celebration cider, too. Do you think babies would like cinnamon? I debated flavoring them up, but figured simple was best and I could always add some spices in later. always made sauce for my babies. (she's so cute!) Thanks for sharing at Your Sunday Best. Oh, what a cutie with that spoon! I love to make applesauce. Delicious! I know your little one with love the applesauce. Yummy! I used to make that for my babies to. You have a CUTIE! You can make this recipe easier by not even peeling the apples!! I made mine like this and it was delicous! The apples I got were not organic otherwise I would have left the peels on. That would make this recipe even easier. Non-organic apples are covered in insecticide and fungicide multiple times during the growing season. Fungicides are particularly nasty. I don't want to expose my liver or a little growing body and brain to that. I am hoping to find someone with an untreated tree in their backyard or such to get some fruit from. That would be ideal! I can't wait to get apples this year to try this out. What a cute picture of the baby! Thanks for sharing at Snacktime Saturday. Looks like you'al are having so much fun. 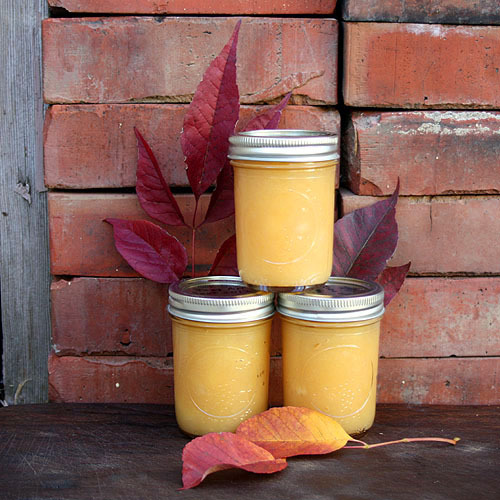 We usually make Apple Sauce every fall, it is so good. Your recipe looks awesome! Hope you are having a great weekend and thank you so much for sharing with Full Plate Thursday. 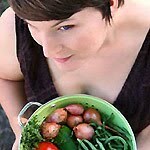 Your little one does make this look like an easy recipe indeed -- she's not even breaking a sweat! Adorable. We had the same problem in Ohio with freezing weather at apple blossom time -- definitely reduced the supply of apples for the year. Thanks for linking on Busy Monday! Looks great. I need to make my own. I'm sure I'd eat it with a spoon, as is if I did! I just found your site through Pinterest and I'll definitely be trying this recipe with the bag of apples on my counter! My son was also born in June and I'm looking forward to starting him on solids. 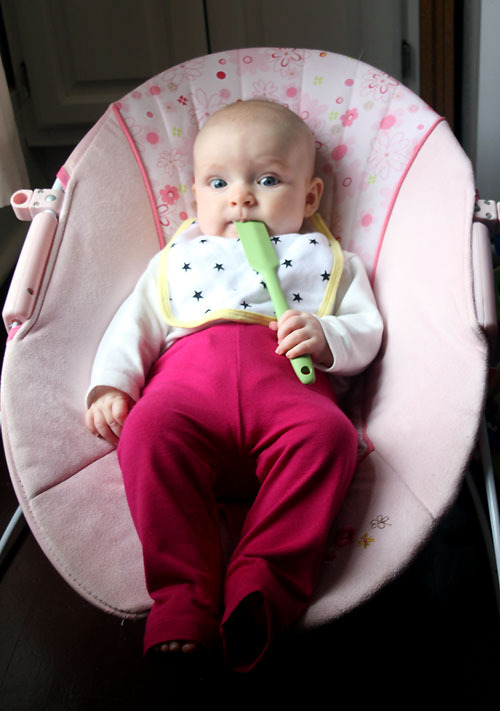 I did baby led weaning with my daughter and I LOVED it. She now eats (or at least tries) everything - including broccoli, spinach, and asparagus. Don't count out kale & chard! You never know.